As you may have seen on BBC South-east Today, The police having concluded that two fellow councillors and I had no case to answer in regard to the complaint covered in their evening news report, one inquiry ends but another now begins as you can can see from the attached letter. While I understand from Twitter exchanges today, that one person in particular would rather not have me share this information, I do believe that the story is now very much in the public domain and as I have not made any of the (36) comments attributed to me in the letter, I very much look forward to seeing how the Council's new standards process, will deal with this matter. At the same time, my two fellow councillors, who are the subject of similar complaints, will I'm sure, be equally interested in how a matter dropped by the police through lack of evidence to the contrary, will be pursued by the standards committee of our local council. Tonight, I see that there is an up-coming documentary on our Police and Crime Commissioner, exploring her work, here in Kent and judging from the preview I saw yesterday, and my own experience of her involvement in my own case, the programme is bound to prove enlightening. People ask why I have announced that I have no plans to stand again as a Councillor next year and perhaps the letter shown above, coming on the heels of a police inquiry of five months, serves as an explanation. Anyone, even minor local politicians, should have an absolute right to hold an opinion on a controversial development, without fear of giving offense, a police inquiry at one's front door, vexatious complaints or even social media harassment from those who may disagree with their position. 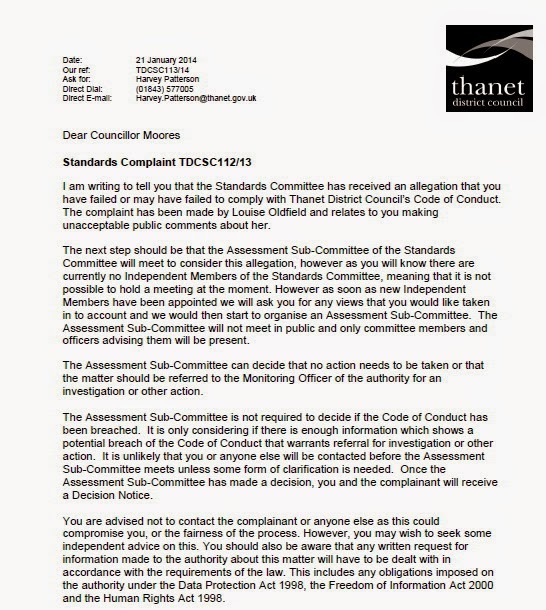 Here in Thanet, the often toxic and adversarial nature of community politics, can make even holding the most reasonable of positions open to vigorous challenge from a small number of vocal individuals and interests. I fear you have an inaccuracy in your blog Simon. The PPC, Sorry PCC "Meet the Commissioner" is showing next week, Thursday 29th at 9pm on Channel 4. I believe an onion is involved. This Cutting Edge documentary meets Ann Barnes, Kent's Police and Crime Commissioner. She had a rocky first year in office, but is her role a waste of money or is she an independent breath of fresh air? Sorry I thought it was this week but I have corrected the text.. thanks. Exactly which comment or comments about Ramsgate are being referred to here, I have no idea. I did see myself misquoted on Twitter though by one person; perhaps that's the one? At the time, I wrote: "Instead, Labour has placed the airport in a commercial straight jacket and while Labour wins votes in Ramsgate, overall, the people of Thanet are the losers." Someone tell me I was wrong? many people in Ramsgate, appear to imagine the demise of the airport will lead to some economic and property-value renaissance. Well Mr Moores this is the kind of anti-Ramsgate comments i am talking about. 1' you think that a house under a flight path is as valuable as one that is not?????? As i said im glad you aren't standing again and from your most recent comments i see i was right in thinking that for a man in your position your not that clever. Can somebody explain to me why those opposed to Manston attempt to reinforce their view by making derogatory remarks about those who hold the opposing view? if you look it up you maybe surprised. Bemused, I am afraid that is what blogging in Thanet is about with certain people. You either agree with them or get abused and insulted if you do not. Look how Infratil's desire to be able to take the odd delayed flight after hours gets turned into 36 clapped out old Jumbos or, as above, 20 night flights by the opponents. Simon is right when he says he has concerns for Thanet's economy, concerns I must say I share. By the way, sorry we got reprimanded for our RAF exchange over on Michael's site, but Simon here is more sympathetic to us ex blue jobs. Very well by tourists is not enough to balance our struggling local economy, high unemployment, disability,, poverty an ageing population and much more. This is not Dubai where I was a week ago and seasonal jobs won't be enough to drive the local economy to become anywhere near self sufficient. where i live has the potential to be wonderful why would you try and turn Kew gardens into a transport hub????? Anonymous - It's you're not clever, not 'your not clever'. Just a little irony in that. I see in the last paragraph that "You are advised not to contact the complainant or anyone else as this would compromise you, or the fairness of the process." A bit difficult if carried out to the letter, especially as you are also told that you may wish to seek independent advice. Pedantic I know, but that's what it says. Simon, You will be misssed but I understand why wish to go. Perhaps Thanet will revive when we get people who are educated enough to spell and attract investment because of our skilled work force. At the moment, half the comments round the blogs would drive any investor off. Sadly Spain and other places with guaranteed sunshine and the availability of cheap flights did for Thanet holidaymakers. In Dorset I believe far Corfe was a good place to visit anon 4:18. Holidaymakers do not bring meaningful jobs to the town and only fill the pockets of hoteliers and food outlets, I would not profit directly from a tourist invasion. The working age population of Thanet probably has many skills, but what of the unemployed and their skills? It is difficult to see how a large employer moving into the area would be able to obtain his staff solely from the local population. There was a time in some parts of the country when people moved from one job to another by merely crossing the road. This was particularly true of the electronics industry around Bracknell back in the eighties. With Manston open and operating 24/7 there could be a chance for Thanet to climb out of its lethargy and become a hub of industry, but it needs the will to make it happen. I switched off at the "hundreds of millions of tourists"... it's quite deluded to quote that figure when the UK population isn't even 70 million. The holiday/tourist industry capable of supporting the population of Thanet died a death back in the mid 1900's, the last nail in its coffin was hammered home in the late 80's early 90's. I suspect that that "hundreds of millions" is in some form of currency 1 o'clock Rob. Hopefully in pounds sterling. Back in the 1900 a train left Victoria every ten minutes for Margate, I believe the journey time is about the same now as it was then. Well, I am sorry you are not standing again. You achieved a great deal during your time as a Westgate councillor and you will be missed. I quite understand, however, why you have had enough. Channel 4 programme "Meet the Commissioner" full page review in The Sunday Telegraph.